This edition of the Mensch Report will focus on a discussion about alternative budget approaches that my colleagues and I feel are necessary for Pennsylvania. As you may know, Governor Wolf allowed HB 1801, the 2015-16 budget bill, to become law without his signature. The bill restored some funding previously reduced or eliminated by the Governor to state departments and programs. HB 1801 was identical to three previous budget bills sent to the Governor since June 30, 2015. The legislature delivered on its promise to accomplish a budget without tax increases. I find it shameful that the Governor took so long to release this funding. It caused unnecessary pain, paranoia, stress, debt, and undue financial pressure on constituents, school districts, Medicaid programs, government organizations, municipal entities and more. Despite the Governor allowing HB1801 to become law, he chose to veto the fiscal code and created another unnecessary crisis for Pennsylvania schools and taxpayers. The state’s fiscal code, which serves as the instruction manual for how the money in the budget is to be distributed, will now cause more financial pain and agony for Pennsylvanians. The fiscal code passed both the House and Senate with a bipartisan vote. The Governor’s intentional choice to veto the fiscal code results in a $439 million cut from schools. A $150 million increase in basic education funding cannot be distributed due to the Governor’s veto of the fiscal code. In addition, $289 million in school construction reimbursements that were originally cut by Governor Wolf on December 29 cannot be restored. It is despicable that he wants to continue holding schools, students, and families as hostages and as leverage for his unwarranted tax increases. I, along with my colleagues, have been relentlessly trying to release funding to our schools and vital state and local programs. The Governor continuously claims that he wants more funding for education yet he is intentionally and maliciously blocking the increased funding that school districts need. This current situation demands that we examine better ways to manage Pennsylvania’s budget process. Senator Ryan Aument, Senator Lisa Baker and I recently sat down to discuss each of our legislation that we are introducing. As you are about to see, the concepts we discussed include a performance-based budgeting approach, returning Pennsylvania to the use of a bi-annual budget, and setting up a default budget process that would eliminate a lapse in funding in the event of another impasse. We owe it to you, the taxpayers, to be responsible with our state spending. After all, it is your money. Therefore I invite you to watch our conversation as we discuss our ideas. I will be holding my next “Teletown” meeting on Monday, April 4 from 6 p.m. to 7 p.m. Teletown meetings are simply Town Hall meetings that are held via telephone. This meeting format allows you the opportunity to have your opinions heard, ask me questions, and listen to state related questions from other constituents from the comfort of their home. You can register for the teletown by visiting https://vekeo.com/event/pasenmensch-23251/. Registration simply means that you will get a phone call and you will not be required to participate unless you choose to. If you have any additional questions, please contact my Red Hill District Office at 215-541-2388. I will be holding my next Coffee with Your Senator event on Monday, April 25 from 8 a.m. to 9:30 a.m. at the Upper Bucks Activity/Senior Center located at Milford Square Fire Company’s Social Hall at 2183 Milford Square Pike, Milford, PA 18951. Constituents are encouraged to attend and join me for coffee and a discussion of state-related matters and concerns. RSVP by calling 215-541-2388 or by emailing srasmussen@pasen.gov. Crews began work on began on the Graterford Road Bridge over the Perkiomen Creek in Perkiomen and Skippack townships. They are working to rehabilitate the three-span bridge that was closed in June 2014 due to severe structural deterioration. Built in 1957, the Graterford Road Bridge is 218 feet long and 26 feet wide. The structurally-deficient bridge was posted with a 14-ton weight limit and carried 2,900 vehicles a day at the time of its closure. The bridge was closed following an inspection when it was determined that the beams and deck had deteriorated to the point that it could no longer carry vehicular traffic. PennDOT’s contractor has restored the bridge by replacing the deck and beams, repairing the piers and support abutments and upgrading guide rail. The anticipated opening day for Graterford Road Bridge is April 22, 2016. ed opening day is Friday, April 22, 2016. The Route 73, Skippack Pike Bridge, will close to traffic on Monday, April 25, 2016 and remain closed for the duration of the bridge reconstruction which is expected to last through the remainder of 2016. The project to replace the bridge’s superstructure (bridge deck and beams) and repair the support piers and abutments is part of a $7.5 million Act-89 funded group bridge project (Group J), which includes the rehabilitation of seven additional bridges in Bucks, Delaware and Montgomery counties. The bridge, which was built in 1929, will be closed and detoured during construction. The bridge carries an average of 12,750 vehicles a day. The proposed detour for PA 73, Skippack Pike Bridge will use Gravel Pike (Route 29) to Plank Road to Route 73 for both the south bound and west bound movements along Gravel Pike and Route 73. On February 9, 2016, the Governor introduced his FY 2016-17 budget proposal. His proposal calls for a $33.288 billion General Fund budget, which is an increase in $3.025 billion, or 10 percent, over the spending plan enacted by the General Assembly in December 2015. When comparing the Governor’s proposal to the so called “framework” budget, it is a $2.5 billion, or 8.1 percent, increase. When compared to his revised FY 2015-16 budget (including proposed supplemental appropriations), it is a $2.45 billion, or 7.9 percent, increase in spending. I wanted to know your thoughts on the tax proposals presented by the Governor. We had an overwhelming number of constituents participate in the survey and the results can be found here. You can remain updated on the budget process and actions by visiting my Budget Page, where you’ll find information on the Governor’s proposed 2015-16 and 2016-17 proposals, information on the General Assembly’s budget plans, charts on spending by department and much more. Our Community Safety Conference on Wednesday at the Richland Township building was well attended. The conference was the sixth in my series of Community Safety Conferences (CSC). 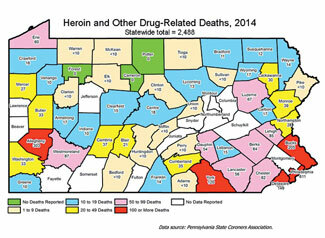 The topic of the March 30th CSC focused on the Heroin/Naloxone Epidemic in Pennsylvania. The event featured Bucks County Judge Rea Boylan, Kathy Jo Stence, Chief of the Systems Transformation Projects of the Pennsylvania Department of Drug and Alcohol Programs, and Diane W. Rosati, Executive Director of the Bucks County Drug and Alcohol Commission, Inc. The Center for Disease Control and Prevention (CDC) reported 8,257 heroin-related deaths in 2013 which was an increase from the 5,925 heroin-related deaths reported in 2012. The Pennsylvania State Coroners Association reported that 2,489 individuals died from drug-related causes in 2014, a 20 percent increase from 2013. In Pennsylvania, legislative and executive branch agencies are working closely on policies and programs addressing education, prevention, treatment, recovery, and law enforcement. The purpose of this CSC was to take closer look at heroin and opioid addiction, specifically treatment and recovery services in Pennsylvania. The panel discussed the Commonwealth’s most current information related to heroin overdoses. In addition, they provided information on current rehabilitation services and options available to those battling addiction. They also addressed the avenues and resources available to family members and community organizations that are helping those who need assistance overcoming their dependence on heroin/naloxone. Attendees were also able to share their current action plans and discuss new ideas on how to combat this grave epidemic. The CDC in 2015 reported that heroin overdose deaths in the United States, fueled by lower heroin prices and the increased abuse of prescription opiate painkillers, nearly quadrupled between 2002 and 2013. According to the CDC, reversing these trends will require a wide-ranging response from multiple partners, from improving opioid prescribing practices and expanding access to effective treatment, to working with law enforcement to disrupt the heroin supply, to increasing the use of medications, such as naloxone, to reverse drug overdoses. 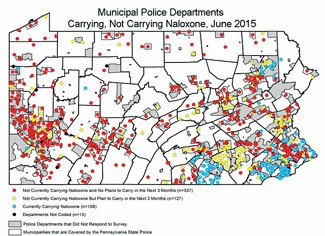 In April 2015, Pennsylvania’s Physician General Dr. Rachel Levine signed a standing order permitting emergency responders to carry and administer naloxone to overdose victims. Due to concerns that only medical personnel should administer the drug, some police officials did not carry the treatment. Footage of the meeting will be available in the coming weeks on my website. The American Trauma Society, Pennsylvania Division is a non-profit organization committed to preventing traumatic injuries and deaths through education. They provide presentations and educational materials on many trauma prevention topics, including concussions, water safety, senior falls, bike safety and traffic safety.